Technology and innovation are KDF's charter, and that is why we are the lead producer of batch inline system's. Today’s consumers are accustomed to a certain level of imperfection in electronic devices. An LED flashlight may fail. A laptop may no longer boot up the way it did just yesterday. But while these everyday equipment deficiencies may be accepted as part of modern living, the stakes are much higher when it comes to medical devices. requirements and feature an intuitive interface to monitor parameters. 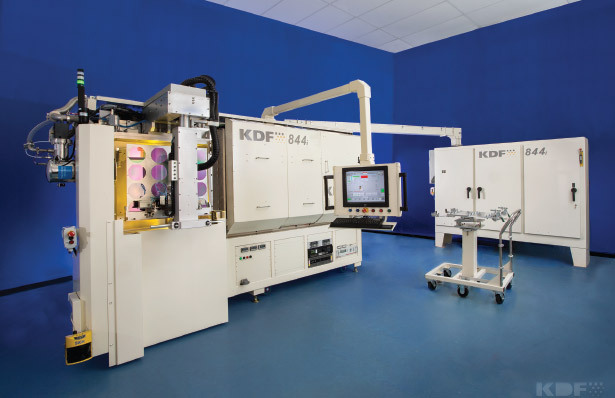 Founded in 1986, KDF is a leading supplier of physical vapor deposition (PVD) batch inline sputtering tools. These vacuum coating systems are used in the production of mainstream silicon, emerging materials, fl at panel displays, optical communications and medical devices. From headquarters in Rockleigh, New Jersey, KDF serves a global customer base and supports more than 3,300 systems in the field. Virtually always located in a cleanroom environment, sputtering tools precisely deposit thin films of various materials, metals and/or dielectrics onto a substrate. Next, the wafers typically enter etching or patterning equipment. Depending on the application, the substrate can return to the sputtering system several times during the manufacturing process to add different layers. As more companies embrace contract fabrication, recipe control and monitoring has become increasingly important. In this emerging business model, a manufacturer provides fabrication services for a wide range of customers – each requiring different processes. In 2010, KDF adopted a Rockwell Automation® control and information platform for their equipment featuring an Allen-Bradley® CompactLogix™ controller and an RSView®32 HMI solution. To enhance system performance, the company recently migrated to a FactoryTalk® View Site Edition (SE) HMI platform. In addition, the company opted for a CompactLogix 5370 controller (L36ERM), which features faster processor speeds and supports up to 16 axes of integrated motion over an EtherNet/IP™ network. KDF systems are designed to monitor all process parameters including power supply voltages, sputter gas pressures/ratios, residual gas analyzer (RGA) background species vacuum integrity checks, substrate temperatures and more. The FactoryTalk View application helps enable real-time operator monitoring of those parameters through intuitive displays – and provides an audit trail of operator and alarm information in a centralized log database for absolute process validation. As an option, KDF customers can add FactoryTalk Historian to their system. FactoryTalk Historian features built-in connectivity to FactoryTalk View and provides robust, high-speed data collection and analysis capabilities. For efficient system development, KDF applies the same Rockwell Automation control and visualization platform across its complete machine portfolio. Looking toward the future, KDF is positioned to respond to fluctuating customer requirements – and an unpredictable marketplace. Have questions? Need a quote? Use our quick contact form to reach us quickly. Copyright KDF Electronic & Vacuum Services Inc. © 2019 . All rights reserved .